Throughput testing as a virtual network function based on RFC 6349. ​TrueSpeed™ VNF provides network operators and enterprise users with a repeatable, standards-based test methodology to resolve complaints about poor network performance faster than ever before. The transition of enterprise applications to the cloud, the proliferation of high-speed LTE mobile data from limitless apps, and the relentless growth of over-the-top (OTT) streaming video in consumer broadband combine to increase the strain on network data capacity. All the while, customer expectations of high-quality data services continue to ratchet up, resulting in unacceptable customer churn when those expectations are not met. With TrueSpeed VNF, operators can leverage their installed base of commercial-off-the-shelf (COTS) server resources to quickly evaluate the customer experience of their network and provide actionable information to resolve any problems. Based on the IETF RFC 6349 TCP throughput testing methodology, TrueSpeed VNF performance tests serve as a neutral 3rd-party evaluation of network quality. 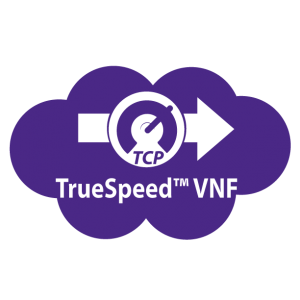 Operating as a virtual network function (VNF) in conjunction with VMware hypervisors, Red Hat Linux, and x86 compute resources, TrueSpeed VNF deploys quickly and tests reliably in all parts of an operator or enterprise network.